Dentistry is a branch of medical science that specializes in the treatment, diagnosis and prevention of the diseases and conditions of the oral cavity and related parts of the mouth. A dentist is a dental surgeon that specializes in the treatment and diagnosis of different conditions of the mouth. 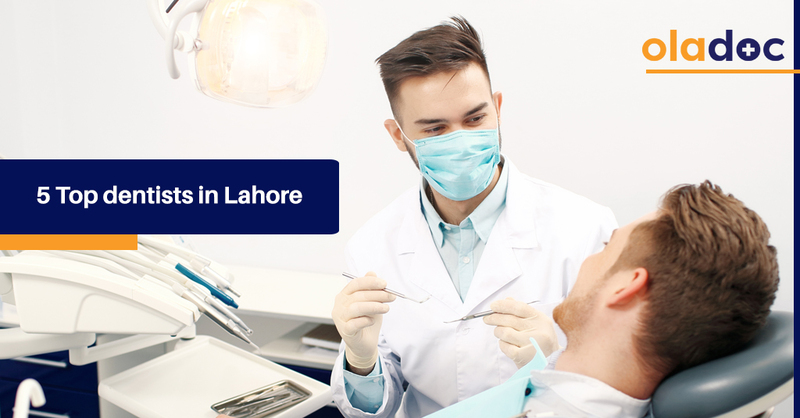 The following are the top 5 dentists in Lahore based on internet search by users in Lahore. With almost a decade of experience under his belt, there is no doubt that Ali Raza Jafri is one of the most renowned dentists of Lahore. He did his BDS from de’Montmorency College of Dentistry, University of Health Sciences Lahore in 2007. After doing his specialization in Orthodontics, he became a consultant orthodontist in Ittefaq Hospital (Trust) Model Town, Lahore. In addition, his diverse knowledge is also honed as he is also part of the faculty of Akhtar Saeed Medical & Dental College and Faryal dental college as Assistant Professor of Orthodontics. His knowledge, experience and passion both as a practitioner and professor makes him one of the best in his field! You can book an appointment with him by clicking the above link. He practices at Saadan Hospital from Monday to Saturday from 10 AM onwards. With over 35 years of experience under his belt, Prof. Dr. Amin Rahman is no doubt one of the leading dentists of Lahore. Dr. Amin Rahman specialized in Implantology and Periodontics from the Harvard School of Dental Medicine along with a Masters in Public Health from the Harvard School of Public Health in Boston Massachusetts, USA. He is a specialist in all surgeries including sinus lift and bone graft. He is eminently qualified to be the team leader of a professional group of dental surgeons dedicated to providing the best possible solution for missing teeth through dental implants. You can book an appointment with him by clicking the above link. Dr. Ambreen Amir is a highly qualified Dentist practicing in Lahore. Dr. Ambreen Amir has the following degree(s): BDS (De’Mont), RDS, M.A.C.S. (Florida), MCPS (Orthodontics), C.Implantology and has 19 years of experience. Her knowledge and skills has enabled her to provide a range of dental services. She currently practices at Rabbani Consultancy, Lahore and Ambreen’s Dental Consultancy, Lahore. You can book an appointment with her by clicking the above link. With over 1800 profile views and 35 years of experience, Dr. Kazmi is a highly qualified and experienced oral, dental and maxillofacial surgeon. He is also honored to have international training and certifications. Dr. Wasim Akhtar Kazmi is an expert in all dental procedures; Implants, Crown & Bridge, Fixed Braces, Maxillofacial Surgery and Gum Diseases. He is also known for being the forerunner of establishing the Institute of Dentistry at CMH medical College, Lahore. He currently practices in Dental Experts, Lahore from 11 to 6 AM. You can find and book an appointment with Top Dentists in Lahore, Karachi, and Islamabad through oladoc.com. You can review the Dentists profiles and search for a Specialist by Locality and Gender as well. In addition, you can check for a doctor’s practice locations, schedules and even book an appointment online. You can also call our helpline at 042-3890-0939 for assistance to find the RIGHT Doctor for your health concerns.